Levi and I have a movie problem. We LOVE movies/stories/tv shows/books. Well, mainly I love books. But in general, we love a well developed story with interesting characters! We tend to wait and see most movies on Blue Ray though because we are theater snobs and cannot stand talking while watching a movie. Unless Alamo Drafthouse is showing it, we probably won't see it in theater. Most of our viewing is done through Netflix and Hastings. Although I'm pretty sure we've watched every single decent horror movie on Netflix already. Here are a few new releases from last week that I watched! Overall Thought: Perfect casting, perfect portrayal of the lifestyle and ridiculously amazing film work. I am fascinated by stories like this, so as soon as I saw they were making a movie out of it I knew I would see it and probably love it. I remember when the Hollywood burglaries were happening, I watched multiple Datelines after the arrest, and even watched the reality show "Pretty Wild" via Netflix which centers around Alexis Neiers. After watching the 8 episodes of their show, I can say this casting was SPOT ON. The acting, the voices, the looks. It was actually weird how good it was. Leslie Mann sounds EXACTLY like Alexis's mom. My one flaw with the movie was that I had hoped it would focus more on Alexis and Tess' characters (Nikki and Sam in the movie). They have such an interesting relationship and I was hoping to see these actresses dive into that more! It felt like the main focus though was on the characters Marc and Rebecca. Which really that makes sense because they are sort of the ring leaders in all of this anyways. I won't give any spoilers, but I will say regardless of how much you know about it already it's still interesting to watch in movie form! The filming of this movie is IN.CRED.I.BLE. Sofia Coppola was the writer and director. She is also behind The Virgin Suicides and Lost in Translation. It's just beautiful to watch, the coloring is vibrant and perfect, the shots are so well done. I want to watch it again right now. Overall Thought: Kept me entertained for 116 minutes, but probably not a movie I would want to see over and over. What I loved about this movie is that it was so much better than I even expected. I try to go in with pretty low expectations on movies like this, but this one turned out much better than predicted! Levi and I will watch anything that is even remotely centered around a cult or some undercover suspicious activity. 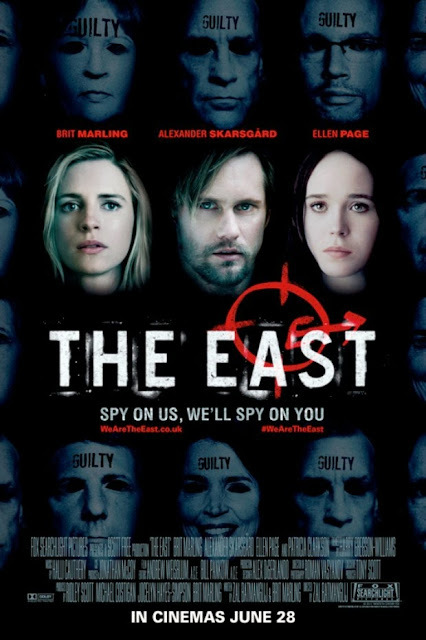 The main idea of this movie is that an undercover "agent-ish" type person is following an underground movement called The East. The East is trying to expose environmental errors made by big businesses. They also do a lot of weird culty type behavior at their lair. It has a great ending, which I always worry about. But I felt like we got full resolution with the characters. I would recommend it! Overall Thought: Just stick with the first one :( The first Insidious is one of my favorite scary movies EVER. But this sequel seemed like almost the exact same movie, but cheesier. I felt like they just tried to use all the same tricks, only adding in a few new ideas and even then, the result was often cheesy. Don't see it. (Although, Levi LOVED it. So I do have to include that).